Have you heard of ZMOT (no, it’s not a new electric car)? This is Google’s comprehensive consumer study titled “The Zero Moment of Truth” or ZMOT for short. The study examined how buying decisions are made today. Past consumers used to use three decision buying steps (stimulus, shelf, experience). Today, a fourth buying step developed called “The Zero Moment of Truth”. This is when customers do research, consisting of looking online at reviews, websites, search for coupons, comparison shop, etc. They do this before they head to a store or pick up the phone to call a business. In fact, Dimensional Research (online research company) study results show that 90% of customers say buying decisions are influenced by online reviews. Moreover, a high-value purchase decision yields more online research by the customer. If a business doesn’t have reviews and the competition does, who do you think generates more trust (with consumers & Google)? 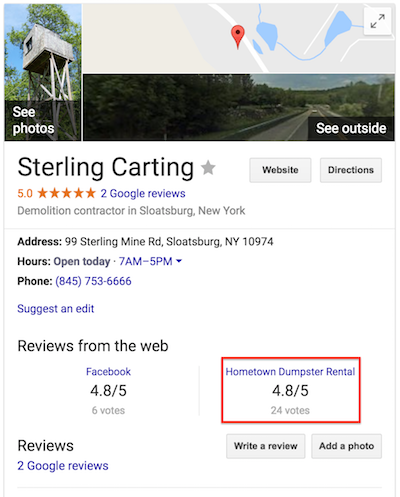 Google uses its own proprietary reviews gathered through Google Maps, they also acquire additional public online reviews from trusted, authoritative websites across the internet. HometownLocal’s consumer lead generation website’s meet Google’s strict criteria. Simply put, website users that require service must come through HometownLocal’s proprietary platform, thereby giving them 100% confidence in the review. 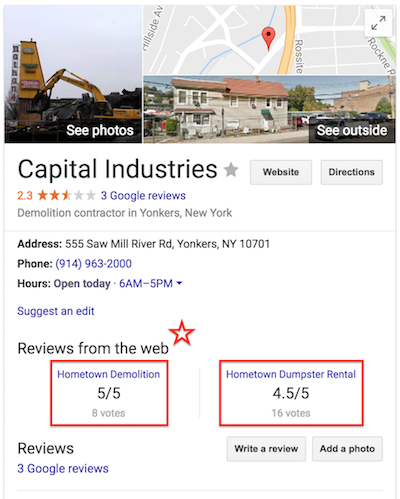 HometownLocal publishes all verified reviews, good, bad or ugly, this gives Google confidence (see Hometown reviews on this page) that HometownLocal reviews are authentic, true customer experiences. Businesses that have a real, tangible review generation strategy will survive in an ever-increasing competitive marketplace. Businesses that do not, won’t survive or they will struggle mightily in the future. Recently, a new HometownLocal customer experienced a $2M revenue stream in 2010 to barely topping $200K today. This business experienced a high-ranking position in Google’s organic search results. The business enjoyed the increase in sales…until Google’s algorithm changed. The business owner’s inaction was disastrous. The owner lamented that “it’s all Google’s fault”, not realizing that operating a business requires action today and tomorrow. Businesses that act today, will win tomorrow. HometownLocal is here to tell you that the internet isn’t going away and that customers will want more, not less information about a business. Consider this article a wake-up call. Let HometwonLocal help you set up a review generation strategy. You have taken the time to read this article, therefore, you are already ahead of your competition. Most competitors of yours will not incorporate an online review generation strategy ever (or until it is too late). Sure, they may receive a few, unsolicited reviews, either good or bad. You, on the other hand, will be way ahead, you will have a head start in generating many positive reviews. Your new business review strategy will be a pipeline for new reviews. In fact, it will be part of the fabric of your business. You will not be afraid to ask and receive reviews and you will embrace the process. Why? Over time you will start to see measurable results in more business and better rankings. In summary, your business may offer the best service, the best price, and ultimately the best customer value, but if potential customers see a meager review profile, you will get passed by competitors and Google.